IDC has found a direct correlation between effective document management and improved business performance. Yet recent research reveals that half of organizations rate their document process management processes as ineffective. 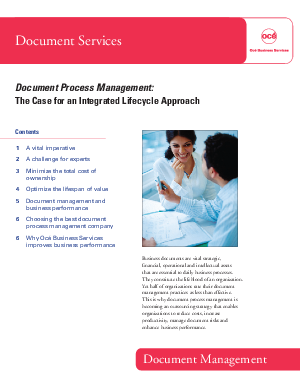 This best-practices paper gives you insight into how you can reduce costs, increase productivity, mitigate risk and enhance business performance through the strategic outsourcing of document lifecycle management.